For the first time in it’s history, iconic British brand Harrods have opened a luxury pop-up boutique on London’s Sloane Street. In collaboration with children’s charity NSPCC the store is called ‘Fashion Re-Told and has been designed with social media in mind in order to generate as much noise as possible. 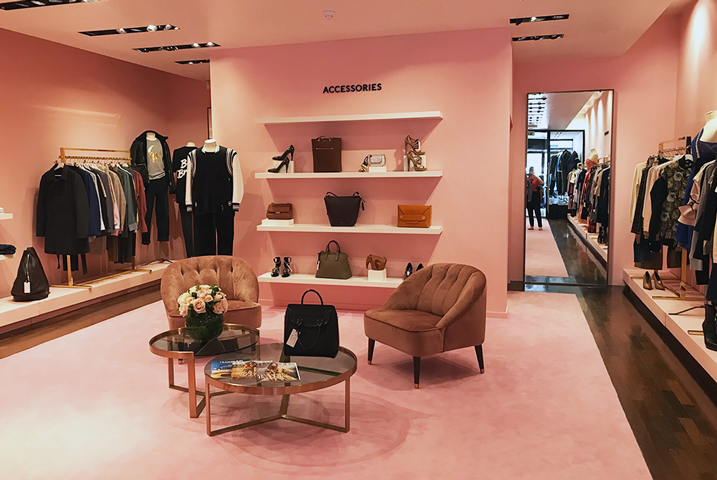 Instagrammers can rejoice at the haven of millennial pink with plush textures and beautifully merchandised shelves. Stocked with pre-loved designer items the rails showcase a variety of high end brands synonymous with the Harrods appeal and customers are encouraged to donate pieces as well as purchase new ones. Designers such as Peter Pilotto, Paul Smith, Mulberry, and Loewe have donated items to the store as well as Harrods staff and regulars. The store itself, donated by Cadoagn Estates, will be open for one month and while clearly high end is meant to create a more fun and lighthearted feel – less intimidating than a traditional high end boutique. All funds raised will go towards helping the NSPCC end child abuse and support services in the city that help young people recovering from dire situations. If successful we may see more designer collaborations supporting those in need. An added feel-good boost to your usual retail therapy.